Authored by Daniel John Stine, Residential Design Using Autodesk Revit 2015 -- book will help the students to understand the residential design using Autodesk Revit 2015. This book presents a project where students build a family living residence using the photorealistic rendering. Like every book of this publication, this book also comes with a CD containing much video project presentation indicating how those tools works. Some initial chapters are filled with user interface, common menu and tool. The knowledge of creating the residential building is elaborately described here. The part by part tutorial learning is helpful for students. In includes elevations, sections, floor plans, renderings, construction sets. 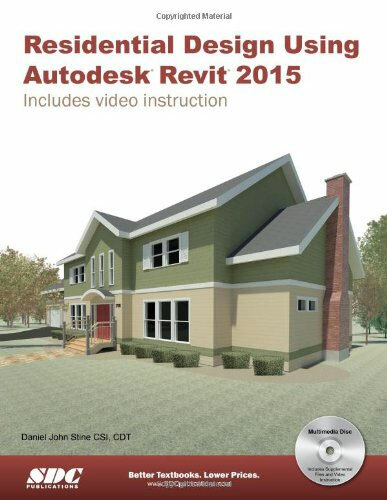 The videos restricted on the built-in CD make it simple to observe the menu selections and will make learning Autodesk Revit uncomplicated and easy At the beginning of each chapter the book reader is encouraged to watch a video that previews the topics that will be covered in the proceeding chapter. This permits the bookworm to be common with the menu selection and techniques before they start the tutorial.